Scotland Under-21 manager Ricky Sbragia thinks Hibernian pair John McGinn and Jason Cummings have the potential to step up to the full national squad. 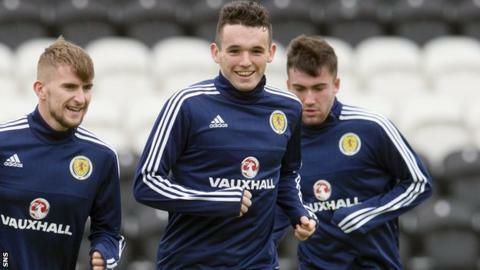 McGinn will captain Sbragia's side against Ukraine, while Cummings is expected to lead the Scots attack. "There's a maturity about John," said Sbragia about his potential. "There's leadership. There's a discipline. "There's also Cummings and, if you have that bit of luck and keep away from injuries, it can happen." Friday's match at St Mirren Park in Paisley is the young Scots' fourth of 10 they will play in European Championship Qualifying Group 3. Sbragia admits it is very difficult to predict how many of his current squad will make it to full international level. But he believes there are more than just the two Hibs players who have the capabilities of being promoted to Gordon Strachan's team in the future. And he says it just about turning on that eye-catching performance that gives you the break into the big time. "There are a lot of players that can take the step up," he said. "Sometimes it's just the moment. "It could be against Ukraine and how well they do. "I presume everybody's expecting John to play extremely well, but you never know until you cross over the line. "Maybe after 10 or 15 minutes, you get a fair idea how they'll do. "There's an abundance of players that can take that step up. " Scotland sit fourth with four points from their first three games, while Ukraine are bottom of the group without a point after three defeats in a row. However, Sbragia will not underestimate his opponents as he looks for his players to claim their second victory in the group. "They've lost their three games to Macedonia, Iceland and France, but they're an exceptionally good team," he said. "They play the long ball, they're very physical, very tall, but decent. "In my opinion, they should have beaten Iceland and probably beaten Macedonia but just failed to be clinical, so it'll be a tough game. "In the group in general, I can't see an easy game, so we know what to expect." Iceland sit top of the group on 11 points, but they have played two more games than the five other teams. France have nine points from four matches, while Macedonia have six points from three matches. Northern Ireland are second bottom with one point from four matches.